One of the reasons my owner decided to get me was because she saw my wild cousins on her last trip to Venezuela. That was in Feb. 2007 and she got me that July. Not a coincidence. 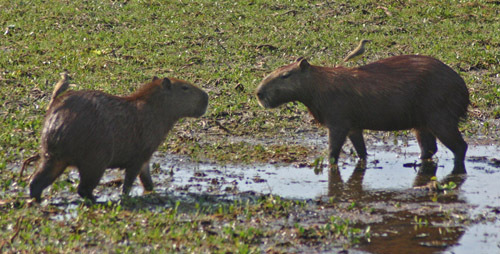 So I owe these capybaras my very life…or at least my lifestyle. I have to admit, I have it pretty cush. These capys have no idea there even is such a thing as air-conditioning, or even heating for that matter. Imagine what that must be like. Capybara family. Male in front, female and infant. I love looking at these photos even though I wouldn’t really like to be a wild capybara. It is something to dream about but not something to really do. What would it be like to live in a big band like this one? And I’ve always wanted a bird to come sit on my back. These North American birds just won’t do it. I want a bird on my back like these two capys have. 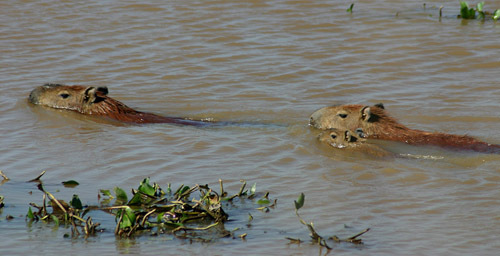 The dark side of the story is the dangerous predators wild capybaras face. I don’t know why my owner and her kids seem to happy hold this killer animal. Don’t they know how dangerous anacondas are? 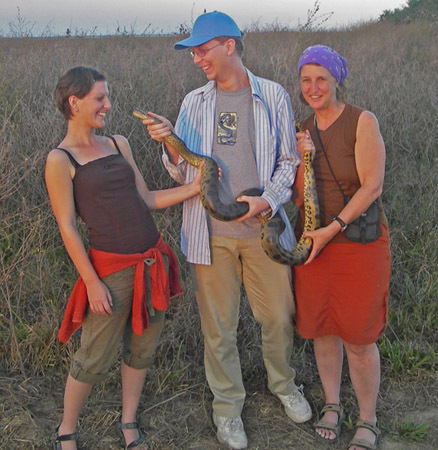 My owner (Melanie) and kids (Coral and Philip) with deadly anaconda. This caiman is probably stalking a baby capybara. They are ruthless murderers of small capys. 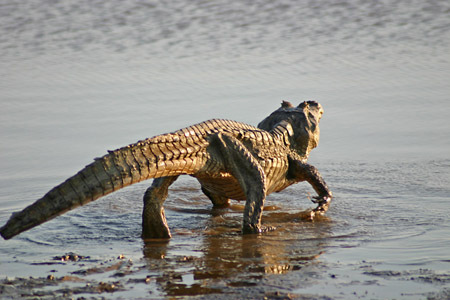 A killer caiman no doubt searching for baby capybaras. 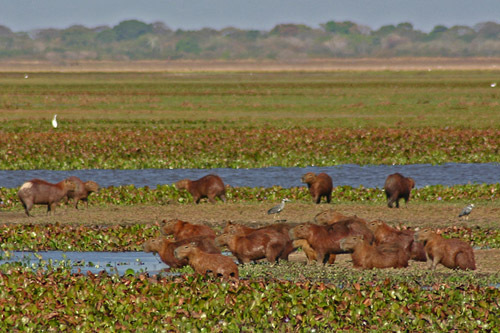 If you want to see capybaras in the wild, my owner and I recommend Hato El Frio, where these photos were taken.